Built in 1760 in the heart of the Berry, the main house was once an old walled priory. It has had many owners but today it is a house where music takes precedence. We have three bedrooms available, each with a private bathroom and toilet. The first, Hermès, on the ground floor, has a four-poster bed and its own lounge; the second, Pénélope, has a double bed; the third, Ulysse, (adapted for longer stays if required as a ‘gîte’) has a double bed, and a sitting room with corner kitchen. All the rooms have television. Additionally, we have a peaceful garden, and an enclosed courtyard for car parking. During the summer, music (flute, piano) and watercolour courses are often arranged. We hope that the music, the atmosphere, the good cooking, and the garden will allow you to relax and that you will feel as if you are staying with friends. The evening meal and lunches are by reservation only and consist of an entrée, a main dish, a selection of cheeses, and a dessert. If you wish to eat here in the evening, please let us know early in the day. Our cooking is done as far as possible with local fresh produce; the style is French and Berrichonne in particular, and we have personally chosen all our wines. The village of Foëcy is at the edge of the Sologne and in the wine region of the Cher between Vierzon and Bourges. There are numerous wine communes, castles and porcelain makers to visit in the surrounding area. We shall be delighted to tell you about them and how to find them. Foëcy was originally an ancient fort which grew up in gallo-roman times and in 1200 the village was called Fessacio. The present name of Foëcy dates from 1529. Foëcy is about 2 hours South of Paris (A10 - A71 exit 6 for Mehun), and 1 hour by car from the airport of Tours (N76 and A85). With regret we cannot accept dogs. All rooms are 'no smoking'. The region’s forests, lakes, castles and wine are all within easy reach. All of these, and the warm welcome, combine to provide a memorable stay in the Berry. 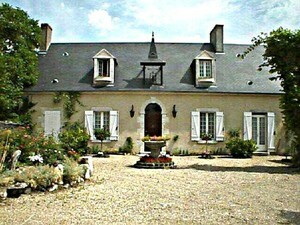 Nearby: Fishing, walking, horse riding, golf, tennis, wine-tasting, Porcelaine Museum. At ORLEANS take the A71 to VIERZON and at VIERZON keep to the A71 but leave the A71 at Exit 6 (marked Mehun-sur-Yèvre) and follow the N76 south to Vignoux (direction Bourges). Once through Vignoux, turn right on the (D30) to Foëcy (there is a new roundabout there but our sign has been taken down by the local mayor). At the end of the road as you enter Foëcy turn left and you will pass the Foëcy Mairie. Continue to the roundabout (with garage) and turn left again then second right, which goes behind the church. ‘Au Petit Prieuré’, with white gates, is behind the church to the right.